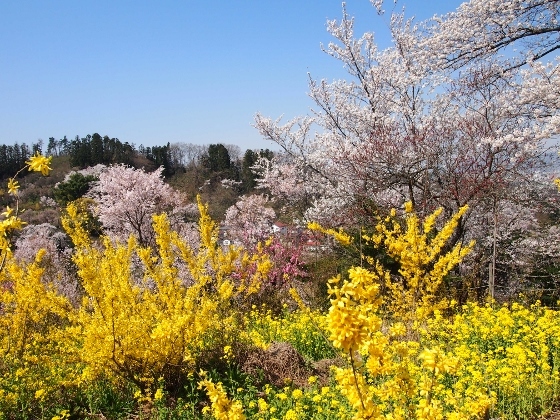 Today I visited famous Hanamiyama Park at Fukushima City. I traveled by train to JR Fukushima Station and then took the Hanamiyama Shuttle Bus to the entrance. 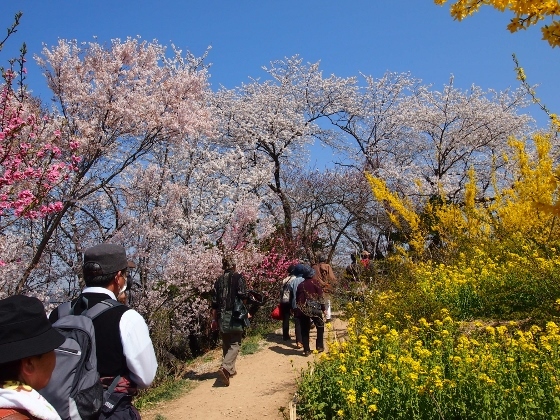 It was a splendid flower viewing travel. 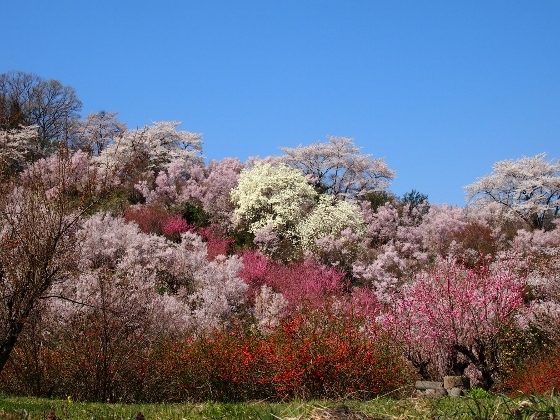 Hanamiyama Park had all kinds of trees and flowers including cherry trees, plum trees, and peach trees, and all those flowers bloom one after another at spring. 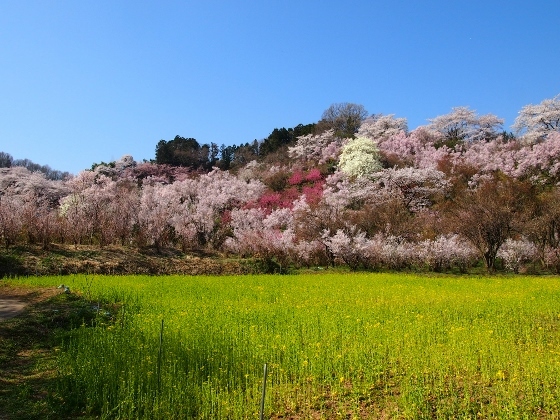 Moreover one can view those flowers over the hill with beautiful Azuma Mountain Range in the background. 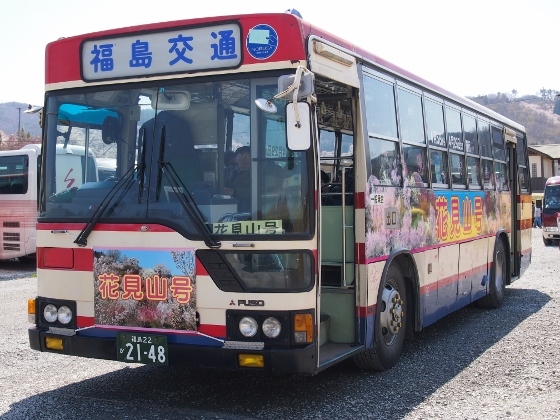 Above photo shows Hanamiyama Shuttle Bus from JR Fukushima Station to Hanamiyama and back. (The fee was 500 yen and no other charge for entrance.) I planned to take the first shuttle bus at 9:00 am, and I was there at 8:30. But the bus started as soon as it was occupied by passengers so that I arrived at the park before 9:00. The bus stopped at the location of red asterisk 1 in the map. Soon after I started walking in the park I met with a spectacle view shown above. The location was red asterisk 2 in the map. Next I kept walking along the Hananotani course which meant flower valley course and found the best view spot. 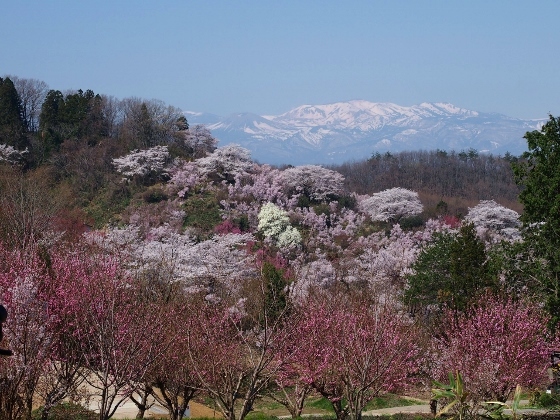 I could see cherry blossoms spread across the valley with Mt. 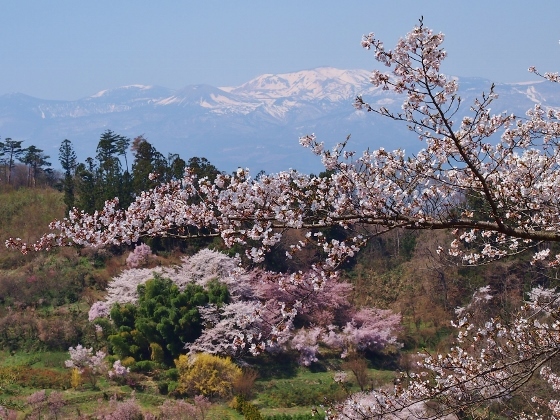 Azumakofuji and Azuma Mountain Range in the background. The location was red asterisk 3 in the map. I turned back for a while and then took another course and met with another splendid view. The location was red asterisk 4 in the map. Above photos show the views walking along the 60 minutes course to the hilltop. There were many visitors in spite of weekday today. 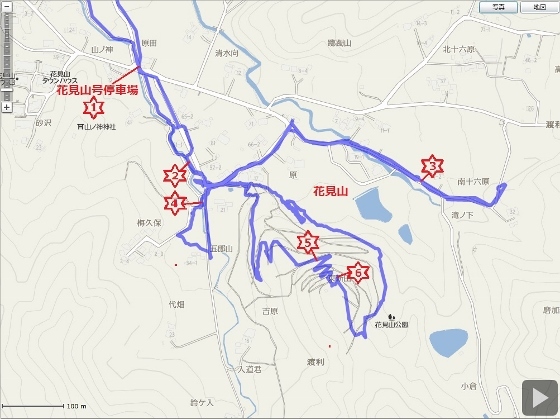 The location was red asterisk 5 in the map. From the hilltop I could see again Mt. 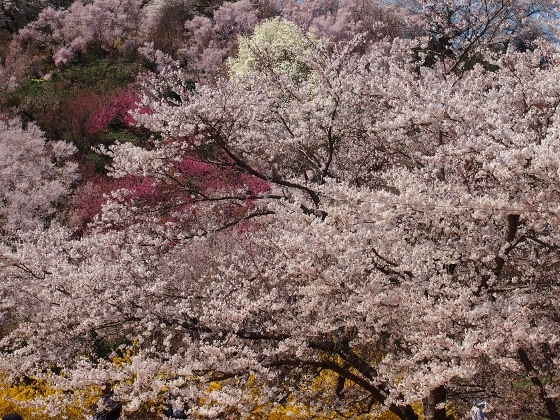 Azumakofuji (left from center) surrounded by cherry blossoms. I could find a snow rabbit on the mountain side. The location was red asterisk 6 in the map.